★ Using the front camera will help you record your own video and also the mobile screen at same time. This option is best for recording the tutorials of any app. 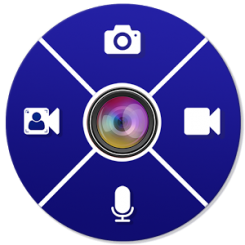 This feature is helpful for app developers to record the video to explain the usage of their applications. ★ Record of any app available on your mobile device can be done in live application usage mode, like typing any message, viewing any video or listening to any audio or anything available on mobile screen can be recorded. ★ This application can be useful to the parents for monitoring the usage of mobile by kids. ★ This application doesn’t use any data bandwidth, as we don’t upload any recording to any cloud network or server. All the videos are recorded and saved locally on phone/SD card memory. ★ App user has the choice to share it through any social media, email, Bluetooth or any other sharing mode. ★ Game users can record their gaming round and create sensation among their gaming community to become a game winner. ★ Youtube video recorders, content creators and App Reviewers/ Recorders can user this easy free tool for creating high quality HD videos and later upload and monetise the content on their own video channels. ★ You can also take the image screenshots with this tool. ★ Recording of Mobile screen can be done with front camera feature which allows you to record your expression for a perfect tutorial. ★ You can do audio recording even without front camera or with front camera of your mobile as per your choice. We are here to view your recorded stories on how this app is helpful to you.